Are changes on the foreign language AP exams going to break your students, or build their language skills? “Students that know a second language statistically score higher on any standardized test compared to monolinguals. That’s something!” @darcypippens pointed out on Thursday night. Although her enthusiasm for teaching a second language was universally reiterated by our participants, excitement about standardized foreign language testing standards was not. 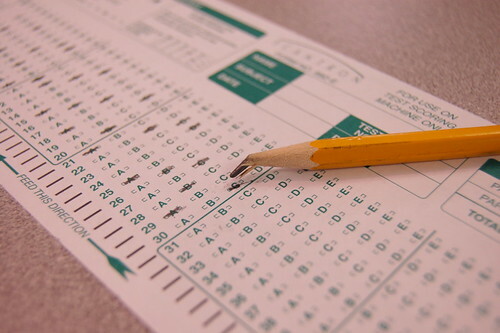 In light of recent changes to testing standards in the National AP exams for world languages, #langchat discussed the impact these changes might have to their teaching, and how to best prepare students to be successful on high-stakes evaluations. Standardized World Language Tests: A Change for the Better? One of the night’s moderators, @dr_dmd clarified the exact types of tests that were likely to be changed in the near future, including the Advanced Placement (AP), Scholastic Assessment Test (SAT), American College Test (ACT) and Common Core State Standards (CCSS). Although all of these tests were mentioned, the focus was placed on the AP and CCSS exams. Specific alignment with ACTFL 21st century foreign language learning standards. Emphasis on interpersonal, presentation and interpretive speaking and writing communication. Testing standards will highlight cultural competency and awareness of TL-speaking cultural perspectives. Six thematic units will drive the testing framework. The themes are: contemporary life, beauty, aesthetics, global challenges, science and technology. Clearly-defined learning objectives and curriculum framework for each element of the AP course, which will directly prepare students for items on the exam. Integration of the ACTFL achievement level descriptions in order to provide consistent feedback and evaluation of student progress. @cadamsf1 pointed out the new addition of a “comparative culture” competency. @dr_dmd then changed the focus towards Common Core State Standards (CCSS). Although the CCSS is not a “new” guideline for some, it is still very fresh to most of our #langchat participants. @trescolumnae provides a link to a document call “Essential Standards” that aligns CCSS with ACTFL standards. He says, “we in NC are really ahead of the game regarding this conversation.” @Dr_dmd also shares a link to a similar document that ACTFL is working on. How to Prepare Students for Changes to Testing Standards? Many #langchat participants had novel ideas on how to best help students become more prepared for the new testing standards. The best ideas focused on maximizing teacher-student time with higher-level thinking activities, more emphasis on communication and cultural competency and authentic resource integration. @darcypippins says, “Lots and lots of input! No grammar specified sections on AP exam.” In addition, she also suggests providing students a variety of authentic speakers to listen to. @dr_dmd encourages teachers to start Wikis based around the six AP exam themes, and shares a link to a collaborative French AP preparation Wiki. As the evening progressed, it became clear that many AP teachers found that the most successful students were well-prepared at lower levels, by excellent teachers. This opening up a two-fold discussion about how teachers can prepare and cultivate their world language programs to ensure success for their AP students and how teachers themselves can be more prepared to support their students’ learning. This love of language and learning is a valuable component for any world language classroom. It is vital to remember that, although scoring well on these tests is important, critical thinking skills, communication and life-long love of language are the true goals. Thank you to our moderators @dr_dmd, @SECottrell, @coleesensei, @placido and @DiegoOjeda66. Also, thanks to all of you that came and shared your ideas and opinions: it wouldn’t be #langchat without you. Please come by our Wiki and share your topic ideas for upcoming #langchats. You can also find a complete transcript of this chat and past conversations online.